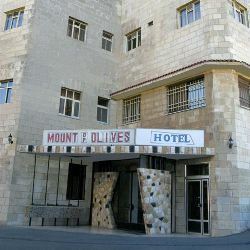 Affordable family-run hotel situated at the summit of the Mount of Olives in Jerusalem, next door to the Chapel of Ascension. Surrounded by famous churches and holy sites including, among others, the Garden of Gethsemene, the Tomb of the Virgin Mary, the Church of all Nations, Dominus Flevit, and the Pater Noster (Lord's Prayer). Commands a dramatic view of the Old City and the magnificient Dome of the Rock. 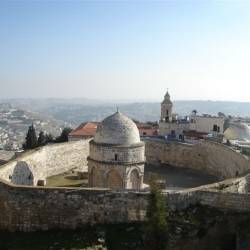 Ideal for independent travellers, budget conscious pilgrims, Holy Land tour groups, and archaeological excursions. A simple accommodation, in a homey atmosphere, at an outstanding value. Amentities include a restuarant, TV room, heat in winter. Our plus rooms include Internet connection, TV, hair dryer, and minibar. 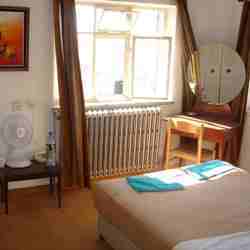 Standard rooms are very simple with comfortable beds, telephone, heating in winter, and en suite bathroom. 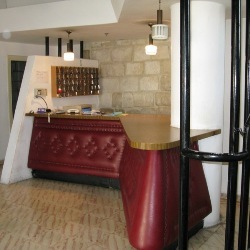 Plus rooms are newly renovated and have a television, telephone, Internet socket, minibar, and hairdryer. 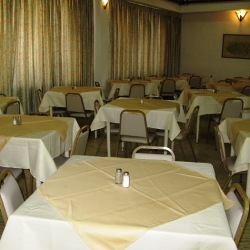 A deposit is required for group reservations of 10 or more people. Airport pickup is available upon request for approx. $65 USD. for a four passenger taxi including luggage.